The Earth's atmosphere, while transparent to visible light, absorbs most "electromagnetic radiations" which belong to the same family as light: parts of the infra-red (IR) and all of the ultra-violet (UV), X-rays and gamma rays. And even in visible light, atmospheric fluctuations (similar to the ones that cause stars to twinkle in the summertime) blur telescope images taken at high magnification. 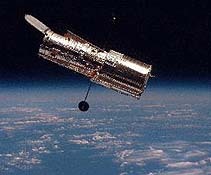 The Hubble telescope, in low Earth orbit, overcomes such limitations, in the visible range and in part of the UV. In a celebrated time exposure "The Deep Field", Hubble remained locked on the same patch of the northern sky for 10 days, returning a sharp image of objects much too faint to be seen otherwise, most of them very distant galaxies. So fruitful was this observation that a second "deep field" exposure of such length, near the southern pole of the heavens, was also conducted. It yielded a comparably rich array of distant objects. In the UV Hubble was preceded by the US-Dutch "International UV Explorer" (IUV), a telescope in synchronous orbit used remotely by astronomers around the globe, like a ground-based observatory. The Infra-Red Astronomy Satellite (IRAS) observed the sky in infra-red and was particularly impressive in its study of the "cosmic background" radiation, left from the "big bang" in which the universe (apparently) began. IRAS was cooled by a well-insulated container of liquid helium, which lasted for months. The very large infra-red James Web Telescope, long delayed and unexpectedly costly, is due to be launched in 2017 to the L2 Lagrangian point (see end of cited web page) on the far side of the Moon. Several X-ray observatories have surveyed and studied X-ray sources in the sky, most notably "Chandra",bearing the nickname of the late distinguished astronomer Subrahmanyan Chandrasekhar. It is a focusing telescope, forming X-ray images with accurately shaped nested metal "mirrors" and relying on the reflection of X-rays arriving at very shallow angles. Launched by NASA in 1999, it is still operating (as of 2016). An earlier X-ay observatory was the European "Rosat" (Roentgen Satellite) named for the man who had discovered X-rays a century earlier. Another European observatory, Beppo SAX (named after the physicist Giuseppe "Beppo" Ochialini) has helped pin-point the first visible source of X-ray and gamma ray bursts. The Compton Gamma Ray Observatory observed the start of such events and also provided evidence showing that the sources of these bursts are very distant and they therefore represent incredibly large and sudden energy-release events in the early universe. Later on the Fermi Gamma Ray Observatory, launched in 2008 and still active in 2016, monitored and studied those distant objects. Some satellites specialize in observing the Sun, such as the Japanese Yohkoh and NASA's SOHO. Yohkoh obtained striking images of the Sun in X-rays, while SOHO, launched 1996 and still active in 2016, observed subtle oscillations of the entire Sun, "sunquakes" which told about the Sun's unseen interior. It also observed "coronal mass ejections" headed for Earth, eruptions whose arrival a few days later may bring a magnetic storm. Next Regular Stop: #30 Far-out Pathways to Space: Great Guns? Updated 12.13.2001, edited and expanded 23 October 2016.